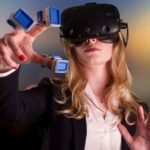 Go Touch VR is an innovation design company delivering touch solutions for VR and AR that provide haptic technology, support and services for academia and companies in the fields of training, engineering, showcasing and data interaction. VRtouch is the simplest and most powerful solution to interact and manipulate Virtual Reality objects. It delivers the best haptics experience on the market and it has been designed to be integrated with any tracking solution for the best flexibility and scalability of your applications.